Understanding The Role Of Carbohydrates And Fat Loss! Go back and read my previous articles on fat loss, spot reducing and cardio, so you more fully understand what we are going to discuss. As we look around today, so much information is available on carbohydrates. The belief in this information as gospel and scientifically sound, has our population fatter than we have ever been. There are so many fad type (low carb, high protein and high fat) diets out there it's amazing to me that anyone can sift through what is exercise science and what is gym science. Go back and read my previous articles on fat loss, spot reducing and cardio, so you more fully understand what we are going to discuss. Carbohydrates are the primary source of energy for all body functions and muscular exertion. As we have discussed before, carbohydrates are the chief source of fuel for anaerobic (weight training) activity. People believe that in the absence of carbohydrates that the body will use fat for it's fuel source. Well that is true, remember, only if you are doing cardio at your fat burning heart rate (Click here to calculate your fat burning heart rate). Since carbohydrates are our chief source of fuel, this leads to rapid depletion of available and stored carbohydrates (glycogen) and creates a continual craving for this macronutrient. 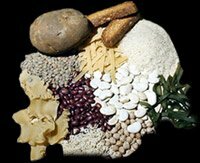 Carbohydrates also help to regulate the digestion and utilization of proteins and fats. The principal carbohydrates present in foods occur in the form of simple sugars, starches and cellulose. Simple sugars, such as those in honey and fruits, are easily digested. Double sugars, such as table sugar, require some digestive action but they are not nearly as complex as starches, such as those found in whole grains, rice and potatoes. Starches require prolonged enzymatic action in order to be broken down into simple sugars (i.e., glucose) for utilization. Cellulose, commonly found in the skins of fruits and vegetables, is largely indigestible by humans and helps very little in the diet. It does though; provide the bulk needed for proper intestinal function and aids elimination. All sugars and starches are converted by the body into simple sugars such as glucose or fructose. All sugars must become glucose before the body can use them for energy. Some glucose or "blood sugar" is used as fuel by tissues of the brain, nervous system and muscles. A small amount of the glucose is converted to glycogen and stored in the liver and muscles; any excess is converted to fat and stored throughout the body as a reserve energy source. When total caloric intake exceeds output any extra carbohydrate, fat or protein is stored as body fat. Carbohydrate snacks, which contain large amounts of refined sugars and starches, typically promote a sudden rise in blood sugar levels, thereby providing the body with an immediate source of energy and few nutrients. The "insulin spike" which shortly follows this reaction, rapidly lowers the blood sugar levels and results in uncontrollable cravings for more sugary foods and potentially causing fatigue, dizziness, nervousness and headaches. Diets that are high in refined carbohydrates are usually low in vitamins, minerals and cellulose. Foods such as white flour, white sugar and polished rice are lacking in the B vitamins and other nutrients. Overindulging in starchy and or sweet foods gives you calories without the nutrients and robs you of essential nutrients to metabolize these foods. If you eat a meal or snack that contains a high concentration of refined or simple sugars and is low in fiber, fat or protein, your blood-glucose levels may rise so high that the pancreas over-secretes insulin. This process drives the circulating glucose into the cells at too rapid a rate. As a result, the blood-glucose level may fall low enough to cause symptoms such as fatigue. The effect that food has on a person's blood glucose and insulin response is called the glycemic effect. The glycemic effect determines how fast and how high the blood glucose rises and how quickly the body responds to bring it back to normal. Most people can quickly re-adjust but those with an abnormal carbohydrate metabolism (diabetics, hypoglycemics and insulin resistant) should avoid foods that severely alter circulating blood glucose levels. Awareness of the glycemic effect of various foods may also be beneficial to some athletes and those attempting to reach very low body fat levels with low caloric intake. By avoiding foods that produce too great a rise and too sudden a fall in blood glucose, athletes may be able to accelerate levels of performance or assist satiety. The glycemic index is a physiological measure of the body's ability to derive glucose from carbohydrate containing food. It is defined as the ratio of blood serum glucose derived from food compared to that which is derived from a solution of pure glucose. This ratio is measured over a two-hour period. Besides the monitoring of my foods, I have also found a few supplements that I consider a must for anyone trying to get to extremely low body fat levels. These ergogenic aids work extremely well for anyone trying to loose extra body fat. Chromium Polynicotinate - In order for chromium to be biologically active in the human body it needs to be bound by Niacin. Chromium Polynicotinate (chromate) has been scientifically shown to benefit individuals in a variety of ways including regulating blood sugar, decreasing sugar cravings, and lowering LDL cholesterol levels. It is also considered to be the best form of chromium available (works 364x better than picolinate) While any guidelines for the use of chromium as an ergogenic aid are premature at this time, doses of 200-400mcg/day are safe and almost any athlete is a candidate for chromium depletion and, thus, supplementation. Vanadyl Sulfate - In human beings, pharmacalogic amounts of the trace element vanadium (i.e., 10-100 times the normal intake from food which is between 10-60 mcg/day) affect cholesterol and triglyceride metabolism, influence the shape of erythrocytes and stimulate glucose oxidation and glycogen synthesis in the liver. Vanadium's primary mode of action is as a cofactor that enhances or inhibits enzymes. Vanadyl sulfate is a salt form of vanadium. Users and manufacturer claim that it's insulin-mimicking effects cause glucose and amino acids to be forced into the muscle to a greater degree than under normal conditions. Anecdotal evidence seems to support user claims of the feeling of "Better pumps" This is probably due to vanadium's ability to increase glycogen synthesis. The amount claimed by users to be safe (all minerals can become toxic at too high a level) is between 5-40 mg, split throughout the day. I know that using these supplements has given me that hard as nails, ripped to shreds look that I have become known for. It just makes sense that if we can control blood sugar and increase the amount of glycogen in the muscle, Carbohydrates can be a bodybuilder's best friend! What was it like on the Jenny Jones show? What was her worst moment in bodybuilding? Much more!